BELIZE CITY, Mon. July 4, 2016–The recently released results of the April 2016 labor force survey conducted by the Statistical Institute of Belize (SIB) indicate that the national unemployment rate is down from 10.1% last April to 8% a year later. Whereas this represents measurable improvement in the rate of joblessness in the country, Belizean youth ages 14-24, and particularly young females—most of whom would like to work in the services sector—still have a much harder time landing a job. The survey results were presented by Curwen Arthurs, Statistician I, at a press conference last Wednesday. Furthermore, among the persons who do have a job, the rate of underemployment is most pronounced among Belizean youth, ages 14-24. This means that they do not work a full 35-hour week, which usually translates into lower productivity and lower earnings. The matter of youth unemployment is a major concern now, as many recent graduates will join the unemployment line with thousands of their peers in the 14-24 cohort. The chart accompanying this article shows where youth unemployment (left) and underemployment (right) are most pronounced. 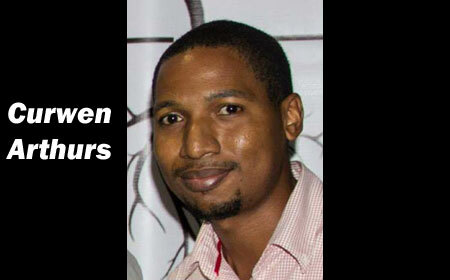 Youth unemployment (ages 14-24) is highest in the Belize District. Next in line are Stann Creek and then Cayo. Whereas Toledo demonstrates the lowest rate of youth unemployment (8.4%) for the age category in question—albeit still slightly higher than the national unemployment rate (8%)—it shows the highest rate of youth underemployment, with nearly one in three youths being underemployed in that district. 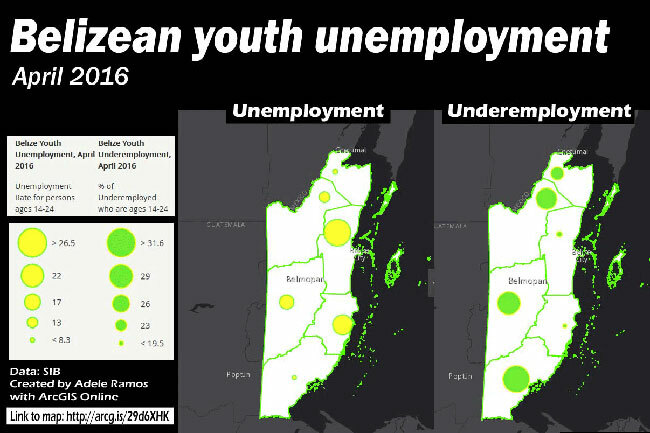 While the rate of youth underemployment is lowest in the Belize and Stann Creek Districts, it is remarkably higher in the northern districts of Corozal and Orange Walk—demonstrating that although it may be easier for youth in those districts to land jobs, more than 2,000 youth ages 14-24 in the north still remain underemployed. The map depicts areas of high youth unemployment and underemployment, demonstrating where emphasis needs to be placed in order to ensure that the productive potential of youth is more fully harnessed.